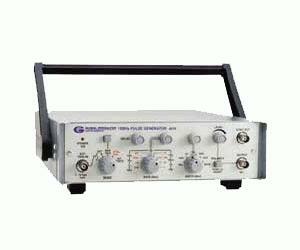 Global Specialties is proud to introduce a new state of the art High quality 10MHz Pulse Generator. This new pulse generator, model 4010 (part number 105-4010) offers low rise/fall time pulse signals at high rep rate of up to 10MHz to meet today’s higher frequency test and measurement applications. The model 4010 features a wide pulse rate (0.1Hz to 10MHz), 8 crystal derived spot frequencies, low rise and fall time (<10ns), a manual triggering facility and pulse width control in 6 decade ranges with variable adjust. It also features a pulse delay control, normal/inverted output polarity pushbutton switch, special sync output, an easy to use front panel layout and is housed in a rugged metal case with adjustable handle. The 4010 is manufactured with the unwavering com-mitment to high quality and craftsman all customers have come to expect from Global specialties, along with an industry-best 3 year warranty to back it up.